A Burglar gaining access to your home through a External Door depends on the strength of the material in the door and the quality and fitting of the locks. Here we are going to describe the difference between a Standard Door with Security Locks & Handles and an actual Security Door with EU accreditation. What should you look for when buying a new door for your home or apartment. A standard Door i.e PVC Door or Composite Door doesn’t necessarily have a security standard applied to it where some Door companies have upgraded the locks & handles to enhance its security but this would not be burglar proof. 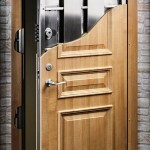 **A hardwood door should be a minimum of 44 mm in thickness and capable of supporting both rim and mortice / dead locks. Hung on at least three 100 mm anti-lift hinges. Glass paneling, where fitted should be laminated to at least 6.4 mm in thickness. The frame of the door should be securely bolted to the wall at no less than 600 mm intervals around the frame. This type of door is the strongest residential door available and when certified to European Security Standard EN 1627:2011 offers a higher degree of security protection. **A security door would have an EU Burglar Resistance Security Standard EN 1627:2011 or the British Security Standard PAS 24-2016 or equivalent. It is recommended that all external entry/exit doors are designed to withstand forced intrusion to an acceptable level. When you purchase a security door you would be supplied a door & frame as your existing frame would not support a new security door. When purchasing a security door you would also be advised on the resistance level of the door as there are quite a few different levels depending on the level of threat you may have. **When employing a locksmith to alter, repair or change locks in your home, they must be licensed by the Private Security Authority since Feb 2017. They must also have and be able to produce Product Liability Insurance and Professional Indemnity Insurance. **Any physical changes or alterations made to doors in your home should not needlessly impede or restrict your exit in the event of a fire alert or evacuation. ***Any final exit door in a dwelling house or a door which gives direct access to a balcony as provided in 1.3.7 should be provided with simple fastenings (thumb latches or other readily openable mechanism) which can be operated from the escape side without the use of a key. Keys should always be kept accessible to occupants but out of reach of potential trespassers or burglars. **When your home is occupied, fire safety is the priority; however, when your home is unoccupied, security is your main concern.